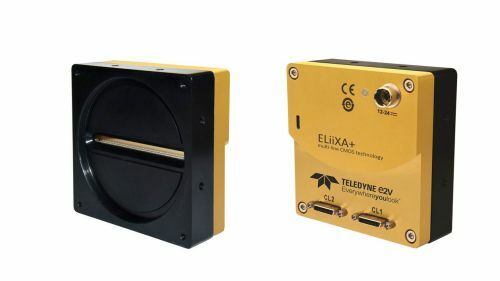 HONG KONG, Feb 28, 2018 - (Media OutReach) - Teledyne e2v, the global innovator of imaging solutions, announces its next generation of line scan cameras - the high-resolution ELiiXA+ trilinear color range. These new 8k pixel cameras are ideal for industrial applications that require high color resolution and image sharpness such as print, label, textile, electronic and PCB inspection. It is estimated that more than 20 percent of factory-based line scan applications already benefit from color imaging. The trilinear configuration of the new ELiiXA+ range not only enables color images, but also makes it possible to use a multi-light set up to discriminate the light coming from different angles in a single scan. This reduces production time, compared to using sequentially pulsing lights. The first camera model in the ELiiXA+ trilinear color range has a CameraLink interface and can be operated at up to 33KHz with an 8k pixel resolution. Designed with cost in mind, it can replace CCD trilinear cameras, enabling system integrators to increase speed or resolution, whilst reducing the cost of ownership. It is an entry-level product with prices starting below $3,000 for a single unit. Due to their highly versatile multiline sensors, the cameras can also be customized for customers that require specific features, including different types of color filters adapted to their application or specific lighting requirement. Customer sampling of the new range will start in February 2018. A higher speed CoaXPress model for mid-end applications will follow later this year. These cameras will share the same form factor and front face mechanics as the CameraLink model, providing customers with the future flexibility to upgrade to a higher spec model, without changing the underlying system mechanics. To find out more visit the ELiiXA+ trilinear product page (http://bit.ly/2oB5Fiv) or contact us (https://www.e2v.com/contact-us/contact/). Teledyne e2v will be exhibiting at Vision China, 14-16 March 2018 in Shanghai, China. You can find our imaging team on booth W5100.